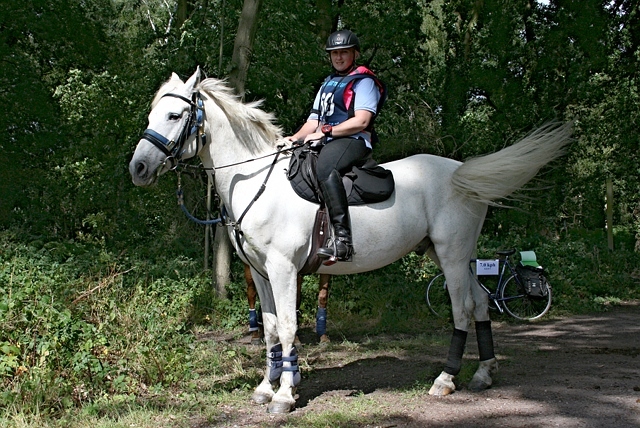 The Barwell Court BHS TREC took place on 17–18 August in support of the Brooke Hospital for Animals and South East TREC Group, at Barwell Court, Claygate. 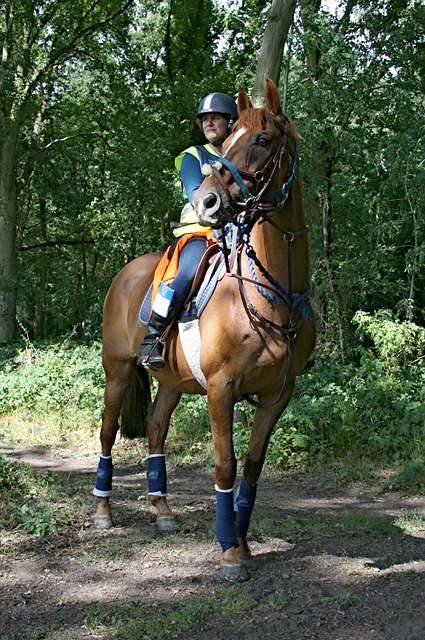 Graham Clack, riding Finnegan, arrives into the check point at Prince's Coverts on the Level 2 POR. 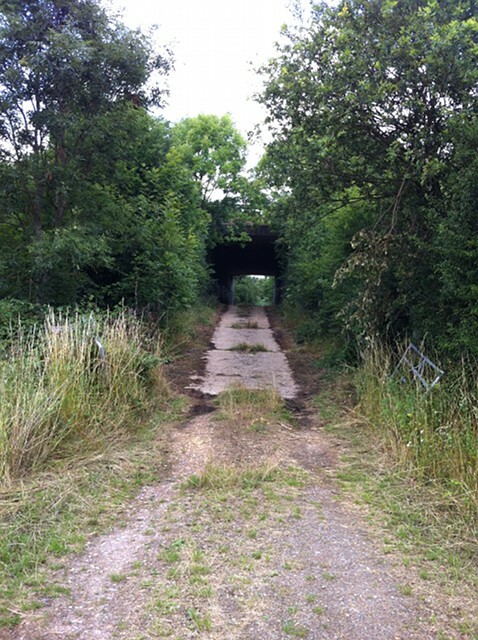 POR report now complete and apology about level 2 ditch crossing. Professional photos available from Chris Sterling Photography. Informal photos taken at checkpoint 5 (L2/3) Prince's Coverts and checkpoint 3 (L1) Arbrook Common. Emails of original photos available on request (c.4-8MB). As many of your know, I have got a rather damaged leg which is currently in a surgical boot. So this year I was unable to give Hugh or Zoe the full support that they need and deserve. 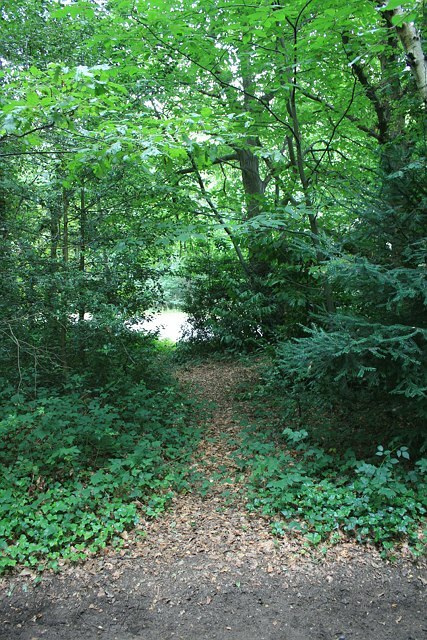 I managed, with a lot of help from our major land owner, Janet Miller and her daughter Rosie, to write the 'private land' part of our POR and did a little bit of trimming in one of the woods with my mother (aged 87!). It was there that I met Sean, a gentleman who lives in the woods (we won't say where exactly) from what he can source from there. He very kindly agreed to clear an old cattle drove for riders' use. Sadly for us all, this will be the last time that we will be able to use Barwell Court Farm as our venue as the land has now been sold to various different people and it is likely that the local landscape will be changing dramatically in the near future, but in the meantime, I would like to thank the Barwell Trustees for allowing us to use this beautiful venue in both 2011 and this year, in particular, Daphne Barker, who did all the 'spade work' for me. This also coincides with my own move to Essex, where I hope to be able to continue running events, so please do look out for them on the BHS website and perhaps, if I am allowed, the South East TREC website too? So, all in all, I didn't feel very well prepared for this year's event and was still madly plonking away on the computer when the chap from the toilet hire company phoned to announce his arrival in Claygate. So, I had to offload the rest of my computing duties onto Hugh [I remember! Ed] and dash over to the venue! Once on the Racecourse field, my dear old green van promptly grounded when I attempted to follow the track up the right hand side of the field as shown on your venue plans. The driver very kindly towed me out backwards and we set off on the route that we eventually signed up for you all to enter the corralling field by. So the loos were delivered, fences opened up and then I hurriedly scuttled round Claygate pinning signs up so that you could find your way to the venue. Only just in time though as I received a call from Graham Clack to ask where I was as he had arrived at the venue. Graham was a complete superstar for the whole weekend. We collected my trailer from Lang's Field, where Willow has been living and while Graham offloaded obstacles in appropriate places, Bob Cripps, Jill Perry and I pinned up venue signage and roped off the walkway, warm up area and map room. Later, we admired my newly acquired pop-up gazebos, which we had erected (very, very easy with 4 people). Jill then disappeared off to cook dinner — a very nice chicken curry, followed by Kay Kitson's take on Eton Mess. Wine supplied by yours truly and a very pleasant evening was spent with them, Anita Thomas and her mum, with Graham Clack and my husband Andrew joining us for coffee. Saturday morning dawned — a nice day. Judges started arriving. My mum, Renate Konn was one of the first, arriving with the day's judges' lunches and very nice they were too! 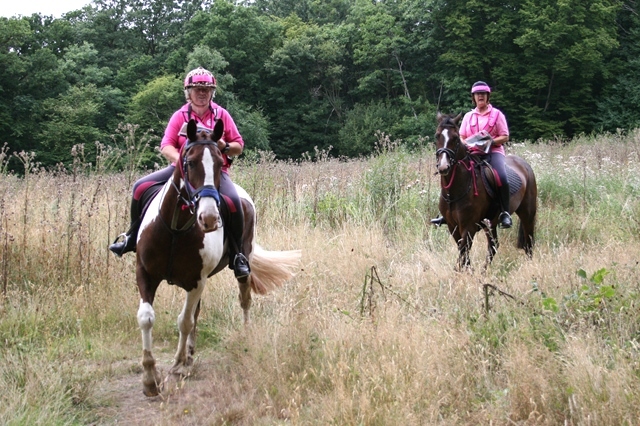 Val Gage from our main charity this year, The Brooke Hospital for Animals, was our equipment checker and Briony Barton, Michaela Few, Jill Hawkins and Naomi Mudie held horses while competitors were in the Map Room. Naomi and Jill went off to help Zoe with the course building around 10.30 and Andrew Snowdon put the Balanced gate together. John Maclean and my mum ran the Map Room. The majority of these people were placed by our technical delegates Joy Taylor and Gemma Marriage. Meanwhile, sponsors of level 3, the MidSussex Hogroast Company arrived to prepare that night's feast, closely followed by Sue Byszewski and her boyfriend Andy, our scorers who were working from Amanda Marfleet's lorry, while Steve Moulton and I pondered on how to build the Steve originated 'log tangle' or woodstack as we had called it on the PTV course, and the official course walk was taking place, ably guided by Gemma Marriage. Those that had purchased tickets then congregated around the map room to enjoy the social, where we were entertained by Jon the magician, who is the brother of Sarah Leggat (his agent?). Later that night, I was lying in my bed in the trailer listening to the rain and feeling the gusty wind, wondering where exactly the map room might be in the morning — middle of the A3 perhaps?! At 08.00, after the very welcome sight of Ann Herrington bringing in the judges' lunches for Sunday, I drove up to the top of Racecourse with trepidation! Much to my amazement, the map room was exactly where we had left it the previous night! Must have been due to Briony and Ri's efforts at repinning it down (I've now got loads of bent tent pegs!). The judges' briefing was due to start at 08.00 — well a little after 08.00 for the level 1 PTV. Fortunately, some of the Level 2 and 3 competitors had offered their services to judge, so I paired them up with those who had arrived to judge the level 2 and 3 competitors later in the day as mentors. So, thanks then to those competitors who judged — Vicki Glynn, Christina Sutton, Sally King, Helena Levett, Amanda Marfleet, Sarah Leggat, Wendy Neath, Kay Kitson, Bob Cripps, Steve Moulton, Katie Holmes, Caroline Barton, Anita Thomas, Diana Maclean, and Ali Large who had withdrawn from the competition but came back to judge for the morning only. If I have missed anyone out, I apologise — I do know that some unexpected competitors turned up to help and I may not have made a note of who you were. The PTV course had been constructed largely from what was already in the field, and Zoe White, our PTV co-ordinator, had done an amazing job. We had low branches going uphill for level 1 and downhill for levels 2 and 3, through the bushes. A short and straightforward reinback for level 1 but going backwards uphill over the full distance and standard width for levels 2 and 3. The maypole was set on a slope. A natural log provided the fourth obstacle. The neck rein was round an existing bush for one direction and a large Union flag for the other direction. Levels 2 and 3 had to negotiate the Devil's Dyke — over a small log, round a dip in the ground and over a 'skinny' rustic jump to complete, then the sidepass and the bending poles. Then the woodstack, which was simulating a log strewn path in the woods [There were a few of those for real on the level 2 POR Ed]. 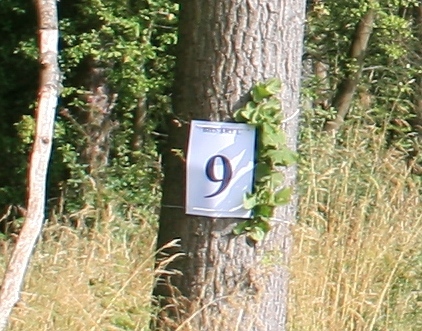 Competitors needed to negotiate their way through in a forward going manner (although remaining in walk) and without hitting the branches on the ground — I judged this in the afternoon and only gave out three 10s, so it was quite difficult to get it right, but most managed a reasonable job. This was followed by the led log and then remount from a tree root — great! 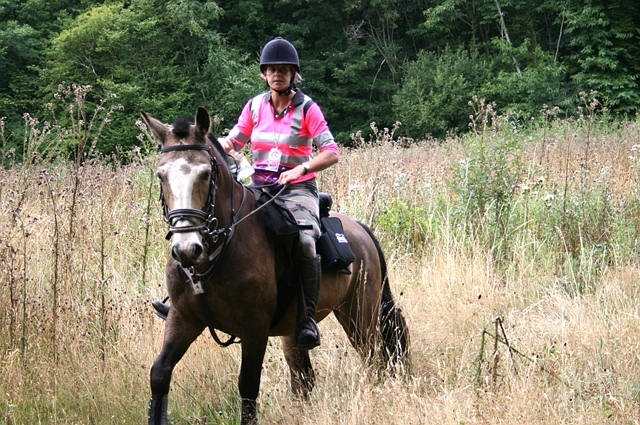 Into the next field to complete the raised S-bend and ridden immobility in the field shelter with lots of flags. Then the gate, and to finish the corridor. After lunch, we had the level 2 and 3 CoP and PTV. We were seriously short of judges for this and many who had been 'mentored' in the morning, ended up judging two obstacles. So my thanks go to the following: Elaine Finch, who stayed right to the bitter end to help clear up — big thanks, Verena Tomlinson, who started competitors off, Pat and John Cooper, all the way, once again from Lincolnshire — lovely to see you again, Kathy Lynn, Chrissie Nicholls and Di Stewart, who had wanted to compete but were let down by their horses. Sue Nicholas from the Brooke. 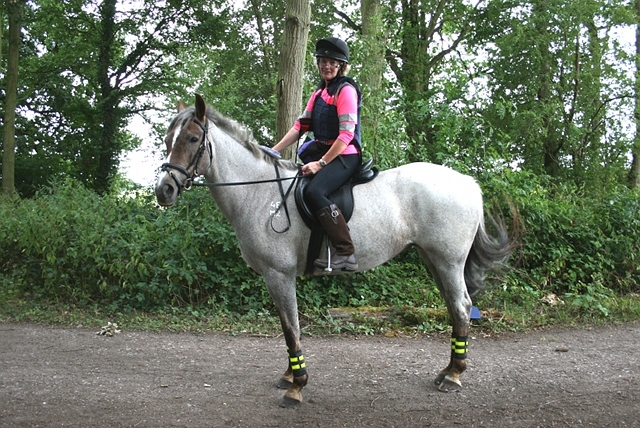 Emma Kareno from East Grinstead — one day, Emma, we will get you competing with Hawthorne! Me (don't really need to thank myself! ), Ri Kirk and her mum Helena Levett, Di Cripps (Bob's wife), Vic Baylis (Tessa's husband), Briony Barton who was amazing all weekend! And finally a very tired and poorly Emily Lacy — thanks for supporting us. Sue and Andy came back on the Sunday to finish off inputing the scores and Joy and Gemma stayed on to iron out the wrinkles as there always seem to be with the scoring system, ROAST! Please do go and have a look at our photographer's pictures on www.chrissterlingphotography.com. Finally, a huge thank you to those that stayed to help clear up, especially John and Pat Cooper, Zoe White, Graham Clack and Elaine Finch. Unfortunately, due to a low turnout this year, we have not raised as much as we would have liked for the charities which are The Brooke Hospital for Animals and South East TREC Group (ok, not exactly a charity but they do do an awful lot for us and the money will go towards paying for the prizes at the Annual Dinner — I believe in January this year and hosted by John and Diana Maclean. I think we will have just over £1,000 to split between them. But to end on a bright note, thank you all so much for coming and making it a very special weekend. Janet Miller, of Loseberry Farm, who generously provided access for riders across the entire farm — including through the farmyard! 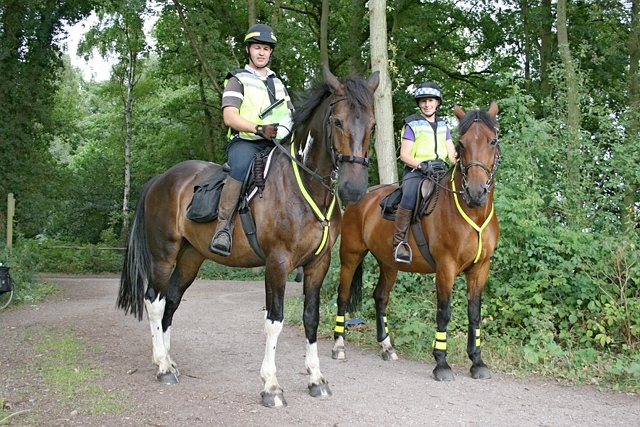 Barwell Trustees, who provide the TREC venue, as well as access in Sixty Acres Wood. 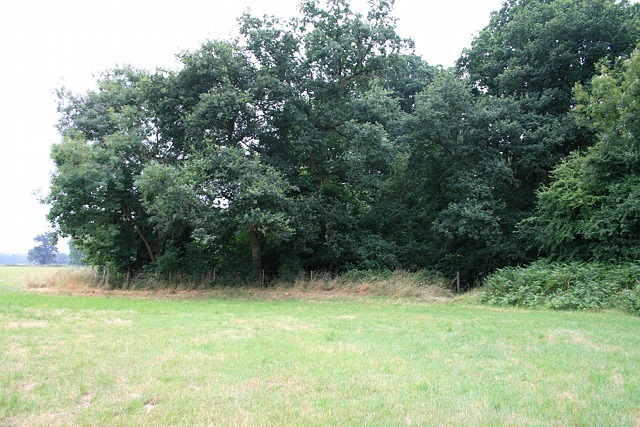 The Crown Estate, who provided access to Prince's Coverts and Great Oaks. Birds Hill Oxshott Estate Company, for access across the private residential estate south of Fairoak Lane at level 2 (and with thanks to its managing agents, Huggins Edwards & Sharp, and its development liaison officer, Gary Blunden for arrangements made at short notice). Coal tax post: © Graham Howard and licensed for reuse under CCL. 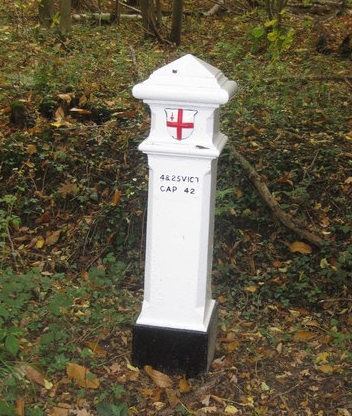 This one is at Birch Wood, and they mark the former Metropolitan boundary. Hypertext links in the report below are to geolocated photographs in Geograph.org.uk (some taken by me, some by others). 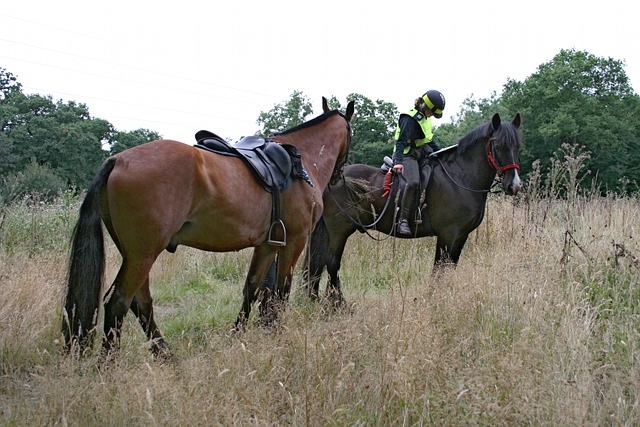 Riders at both levels 1 and 2 set out along the bridleway towards Claygate Common, turning left and south along Common Lane across Claygate Common, and joining Holroyd Road on the south side of the common. A left turn into the byway New Road, closed to vehicles, took them over the A3 and south under the electricity transmission line (ETL) which was a key navigational feature at both levels. 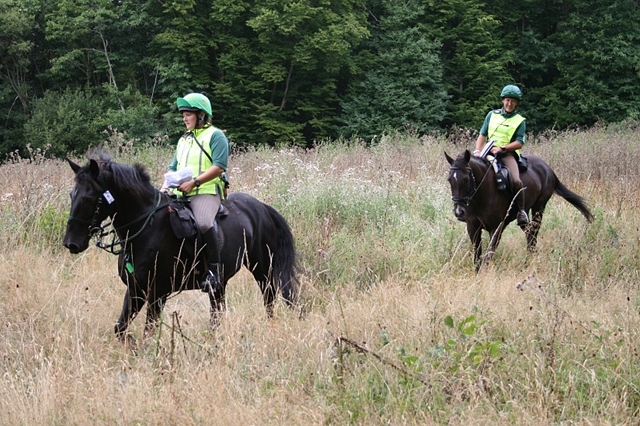 Shortly after passing under the ETL, riders needed to spot a gap in the fence on the right, pass through it, and double back just inside the field. 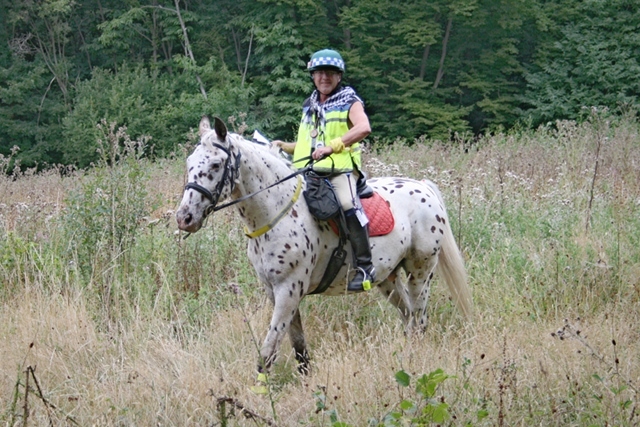 Continuing along the field margin, riders turned west parallel to the A3, crossed a wooded ditch, and continued west towards a tunnel under the A3, known locally as Graffiti Bridge. Graffiti bridge under the A3. Level 2 riders took a short detour here, turning left into Birch Wood down a recently cleared track, and past an ETL pylon where a ticket was displayed (in both directions: level 1 riders came this way later in the opposite direction), before turning right into Birchwood Lane and right again down the margin of a field in the north side of Birch Wood. All riders continued through Graffiti Bridge, with a diagonal left across the field beyond, to reach a gap in the hedge a little short of the far corner of the field. The route continued across the next field to the far left corner, and so under the railway accommodation bridge. A right turn parallel to the railway line brought riders to the enclosed public footpath between Claremont Road and Arbrook Common: a good number of riders turned left down the path, but had to turn back at the narrow footbridge (or worse, the barrier beyond at the entrance to Arbrook Common). Riders should instead have gone through the open gateway opposite, and turned left along the margin of the field. A right turn along a grassy strip marking the boundary between two fields brought a ticket attached to a cattle trough halfway up the field, orientated towards the right hand side of the strip. Riders on the wrong side of the strip would not have seen the ticket. 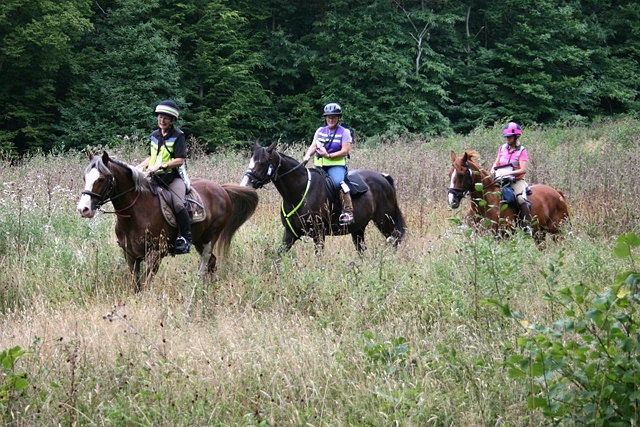 Nor indeed many riders on Sunday (level 1), because the ticket had detached and fallen to the ground: the ticket was therefore regrettably suppressed at that level. The route continued into Loseberry Farm yard and checkpoint 2. 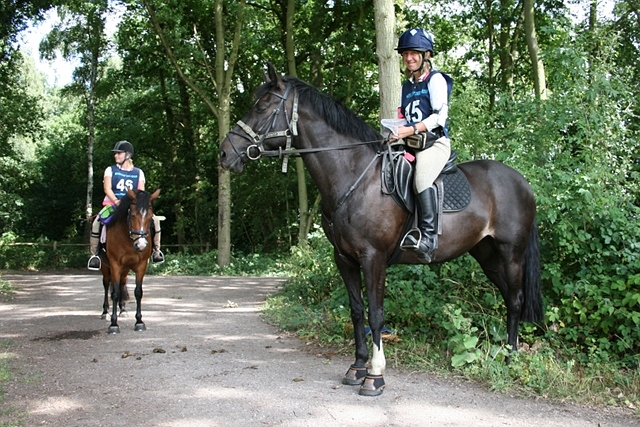 Leaving Loseberry Farm, riders followed a series of farm boundaries south towards the entrance onto Arbrook Common. It was essential to follow the route marked on the master map, as there are few opportunities to cross the ditches on the farm except at the specified crossing points. Here, your traceur has an admission to offer level 2 riders: the marked route was wrong, and showed a route across the ditch which ceased to exist many years ago but which is still marked on the map as a field bridge. The true crossing point was about 300m further along. 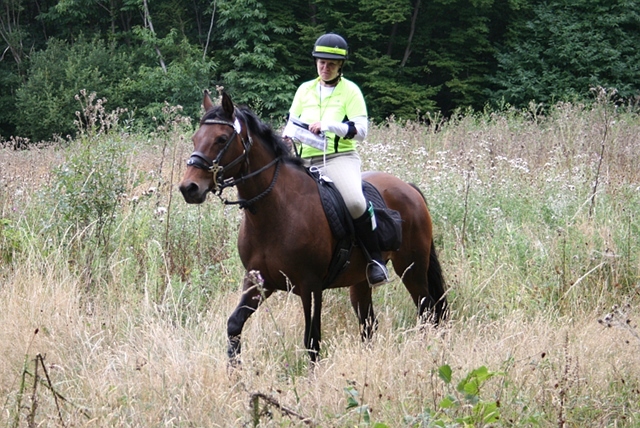 The truth is that we missed out inspection of this field, having sent riders this way in 2011, and I mistakenly recalled this as the crossing point used then. I'm particularly sorry for the couple of riders who bravely attempted a far from pleasant crossing. 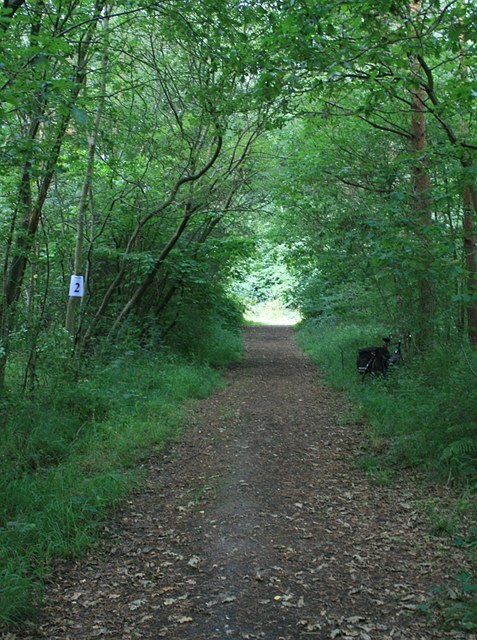 Riders should have found their way onto Arbrook Common through the only gate, and looked for a clear path heading due west. 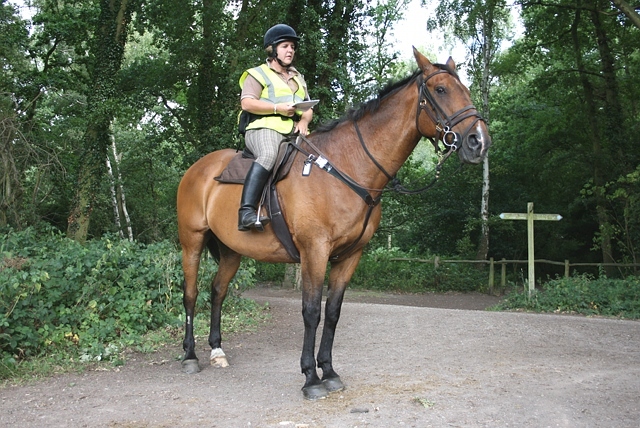 The master map instructed riders to turn south only after the barrier, to bring them onto the horse ride heading south. 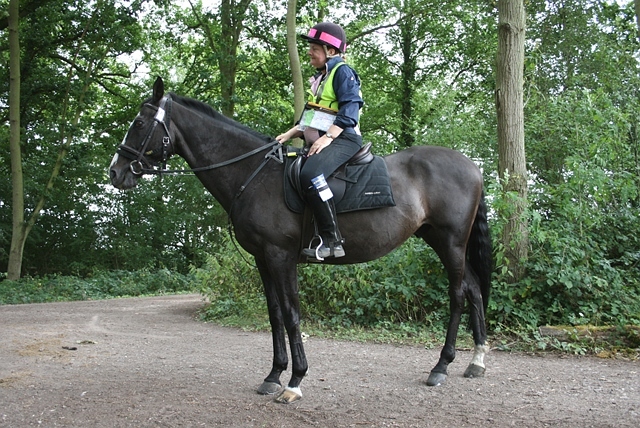 This soon brought riders to a confusing T-junction of horse rides. 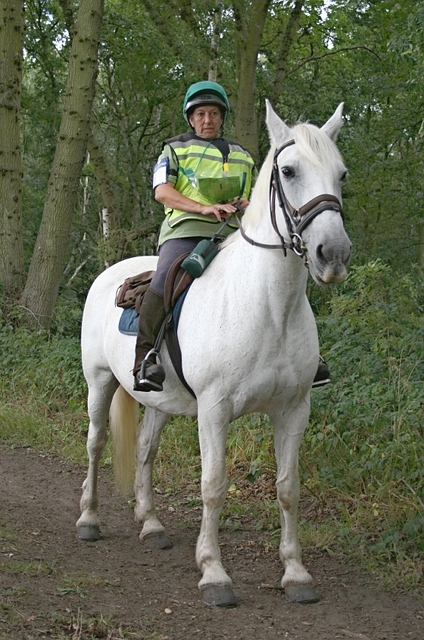 The crossing horse ride is NOT the public bridleway marked on the map, which required a left and immediate right to reach it. 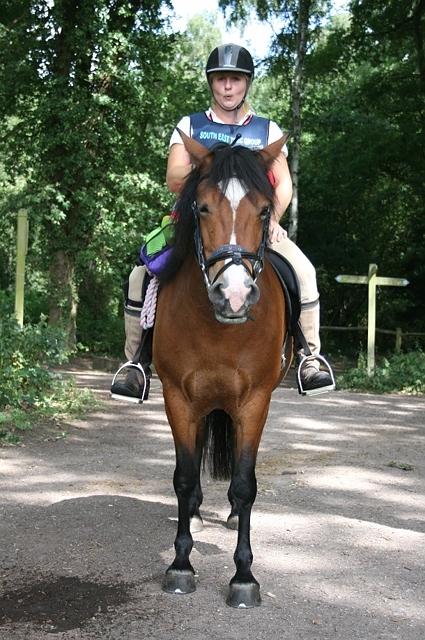 Indeed, the crossing horse ride is not marked on the map (and the horse ride which leads up to the junction has deviated from the original straight alignment). 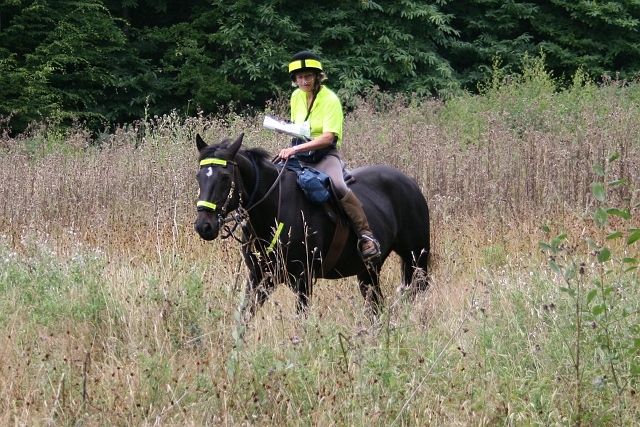 However, the level 1 master map did particularly draw attention to the ETL which here runs parallel to and almost adjacent to the bridleway. 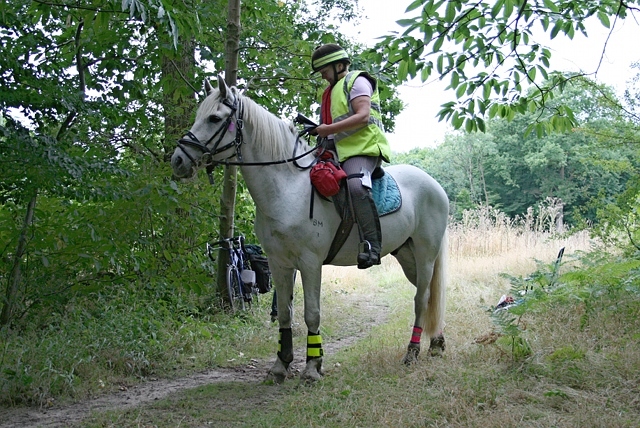 Riders who appreciated that the wires of the ETL were not crackling overhead at the T-junction would have pressed ahead another 70 metres to reach both the bridleway and ETL. And here, the two levels went their different ways. 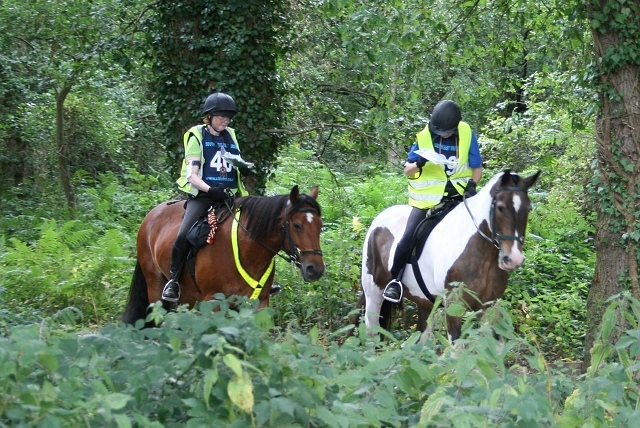 Level 1 riders turned east along the bridleway, still parallel to the ETL, shortly to arrive at a junction of paths on the east side of Arbrook Common, and into checkpoint 3 (photos). 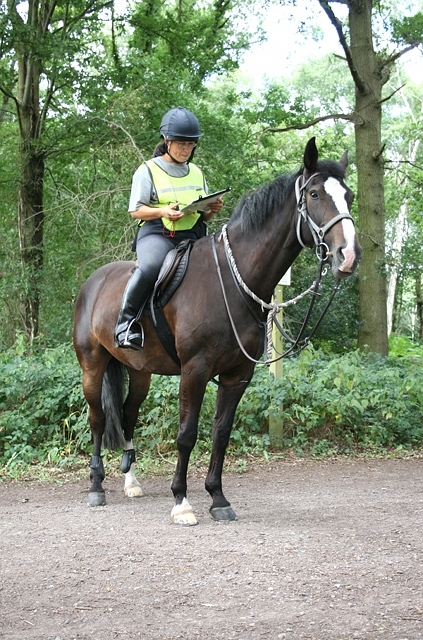 The checkpoint, manned by your traceur, was intended to verify arrival along the bridleway: about three quarters of competitors got this wrong, arriving along the horse ride (or in one case, north from Arbrook Farm). 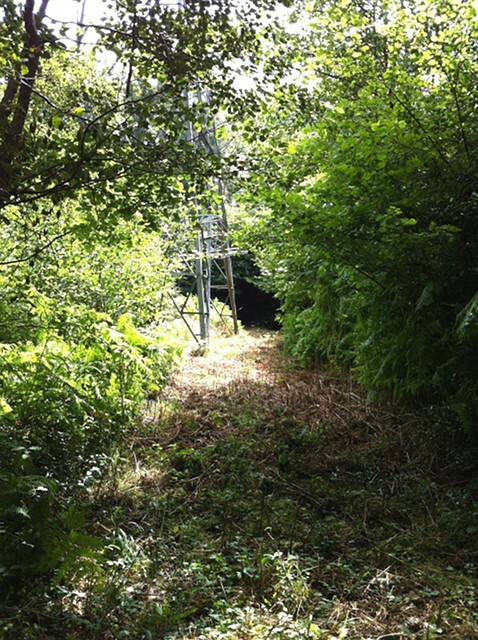 The route out of the checkpoint lay along Birchwood Lane, but with a detour through Birch Wood, past the ETL pylon and ticket seen by level 2 riders (the previous day) in the opposite direction (about two thirds of level 1s missed this ticket, presumably turning right too soon to rejoin Birchwood Lane), and along the field side of Birch Wood to rejoin Birchwood Lane. 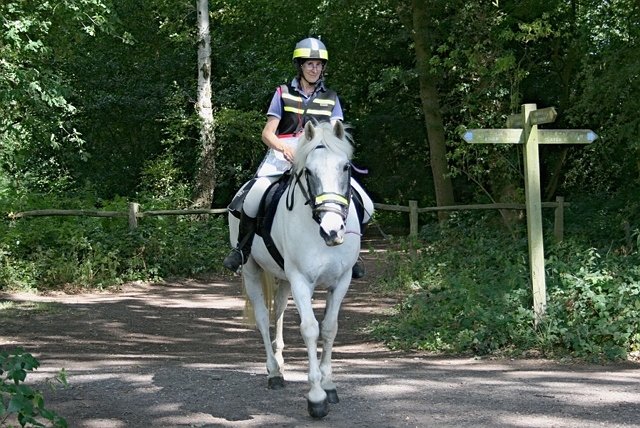 Riders continued straight across the junction with New Road into Great Oaks, and so into Sixty Acre Wood. The route through the latter required careful mapwork, including a particularly tricky turn off the main north-south path just before the ETL (riders by now should have noticed the relevance of the ETL to route finding! ), a PTV ride up obstacle near the charcoal kilns, a ticket (only one individual, but eight pairs, missed this), and finally the last checkpoint 4 just at the northern exit from the woods. The checkpoint was at 10.3 km from the start: from here, it was a one kilometre walk and over the A3 back to the venue. 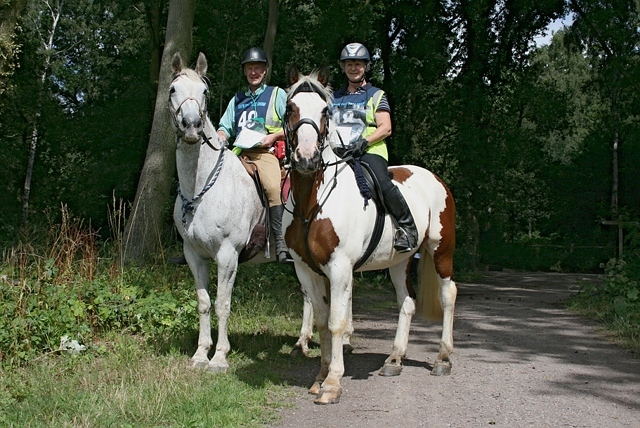 Level 2 riders turned west along the bridleway, shortly joining the drive to Arbrook Farm and into checkpoint 3. 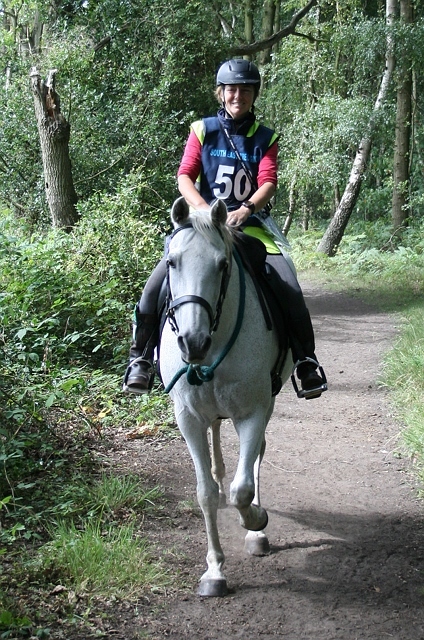 One level 3 individual, and the pair, wrong routed, presumably along the horse ride vice the bridleway, as did about two-thirds of the level 2s. 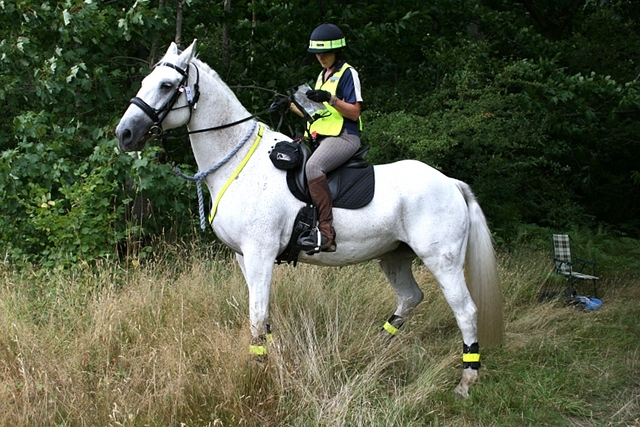 On leaving the checkpoint, riders performed a dogleg off the farm drive to the west, before rejoining the drive to arrive at a crossing of Copsem Lane, the A244. 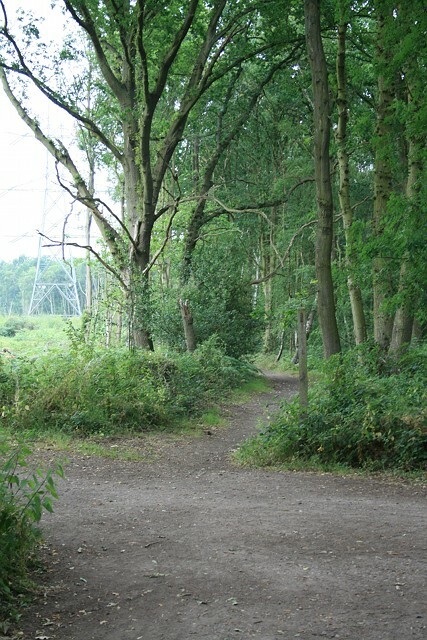 On the far side, the route lay across Esher Common and some faster work. 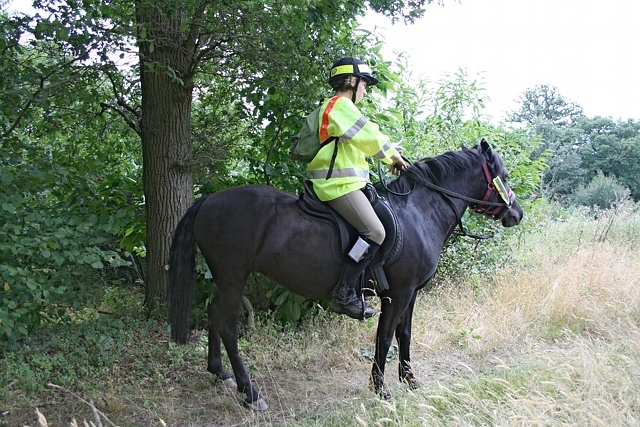 Initially along the horse ride on the south side of Meadway, a turn south into the second horse ride on the left was called for. This took competitors over a ridge and down towards East Bridge over the A3. However, before reaching the bridge, a right turn along a sandy track offered an opportunity for a fast canter, passing the sculpted wooden bench which featured in the level 3 grid references test, before doubling back just short of West Bridge to follow a less frequently used horse ride adjacent to the dual carriageway and back to East Bridge. 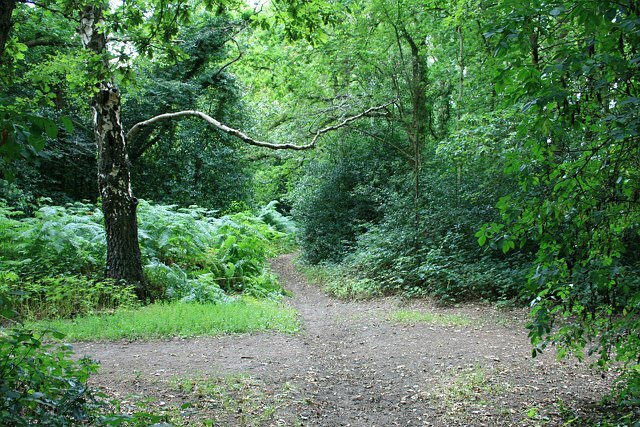 The route then lay south, over the bridge, past the pond, crossing the manorial boundary onto Oxshott Heath, over Sandy Lane, and continuing south to a junction with Blundel Lane and a left turn into the public bridleway east towards Oxshott Station and along the foot of the Heath. Riders passed the cottages on the common, shortly after encountering a bifurcation: which way? 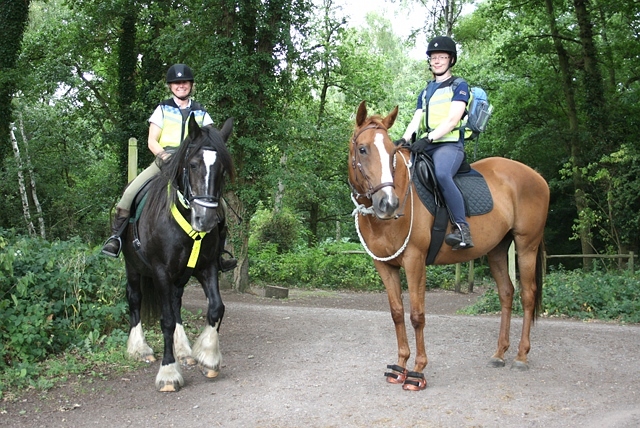 To the left was the horse ride, to the right the public bridleway. The master map showed left to be the correct choice, and those who got this right immediately right routed into the checkpoint 4 at Oxshott Heath car park near the station. Surprisingly, only one level 2 individual, and one level 3 pair, wrong-routed, although rumours have been abroad that some riders managed to turn back from the car park having realised their error, and right route without penalty. Leaving the checkpoint, the route continued up the corkscrew next to Warren Lane, before a minor path turned off to the right, shortly to emerge at the side of Warren Lane. 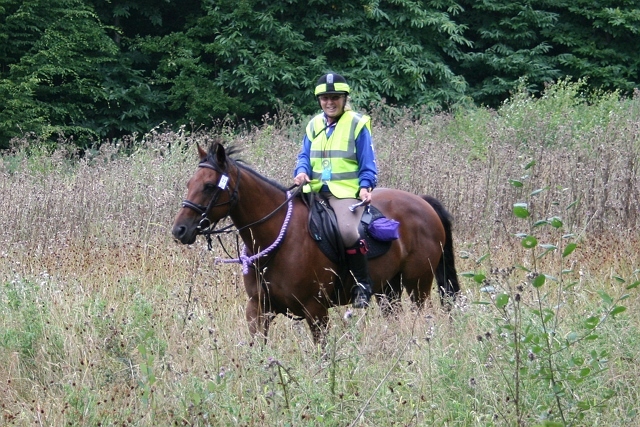 This crossing was stewarded, and took riders across to a seldom visited area of heathland. Careful adherence to a slightly defined path led down to the one-way Heath Road, leading down to a bridge under the railway and so out to the busy Fairoak Lane. 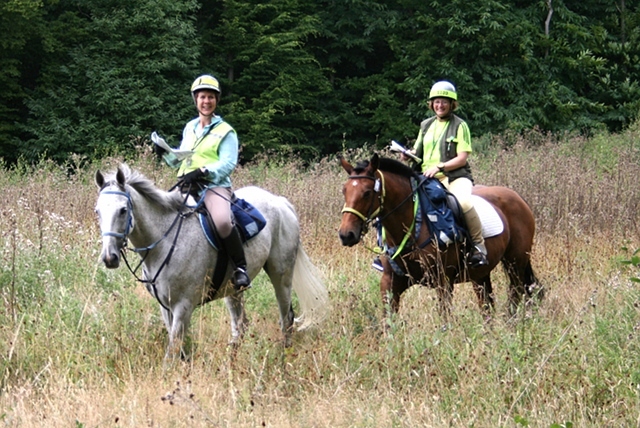 A stewarded crossing of the main road, and passage through the specially open electric gates took riders into the private Birds Hill Estate, courtesy of Birds Hill Oxshott Estate Company. Heading down Broomfield Ride, some riders were confused by the first turning shown on the map leading to Montrose Gardens, and assumed that the correct turning into Leys Road was in fact the wrong first turning. However, the first turning is virtually invisible, and as is clear from careful study of the map, is no more than an alleyway. We did plan to route level 2 down this alleyway, but excessive overgrowth from neighbouring hedges over a short stretch made it unsuitable. 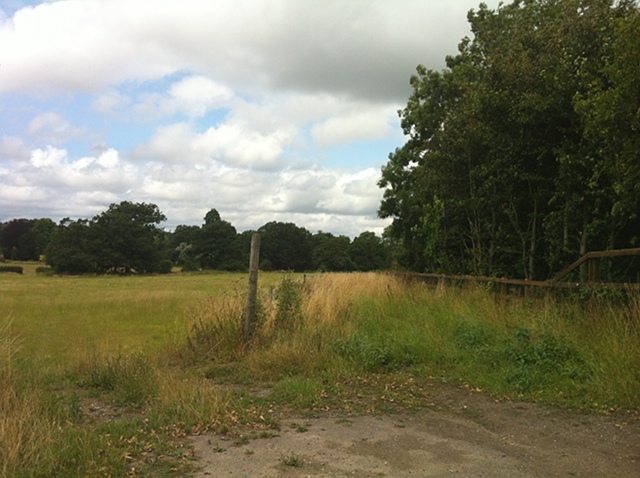 Once the turning into Leys Road had been identified, a right turn at the end brought riders into Prince's Drive, and shortly through a gate on the left into a track leading to paddocks and into Prince's Coverts. As usual, route finding in Prince's Coverts called for careful map reading with possible use of compass. 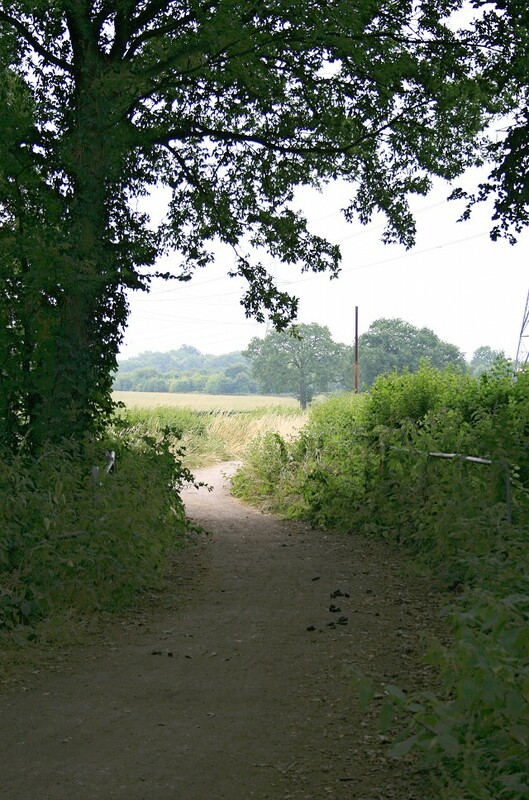 Shortly after entering the woodland next to the paddocks, a right turn was needed down a narrow but frequently ridden path which kept roughly parallel to the field boundary. This emerged on the main west ride, with a turn right and so southwards. 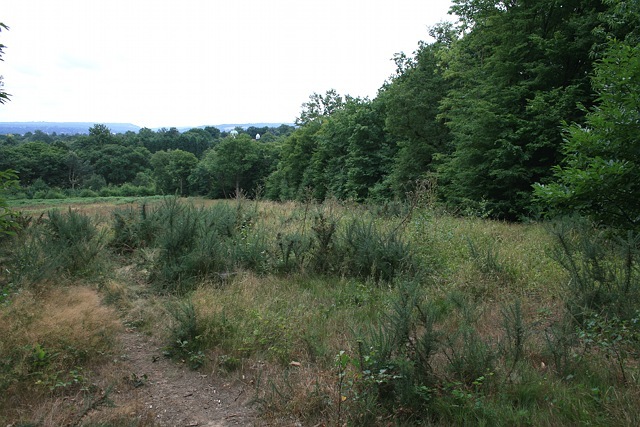 The west ride continued past the recently felled Stoke Wood: a path across here was used for the 2011 POR but the growth of brambles ruled it out this time (a pity, since the entrance off the west ride is particularly well hidden). 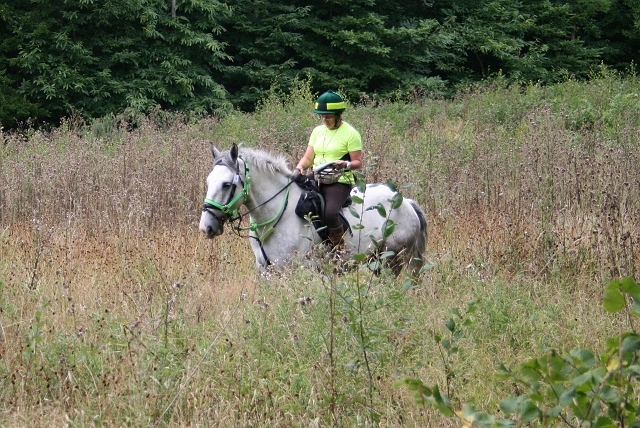 Instead, riders took the first practical path on the left beyond the felled area, opposite a well defined track on the right. Just down the path was a ticket, which remarkably everyone scored. Riders then headed east, then south, along several rides west of d'Abernon Chase and past some difficult crossing paths, before turning west again along the main ride to Prince's Gate, and looking out for a new track (not marked on the map) south through the woodland below Horns Hill. Here lay a particular challenge: the track emerges at the top of a heathy slope (again not marked on the map), where a clearly defined path dropped down to the south east along the east side of the heath. 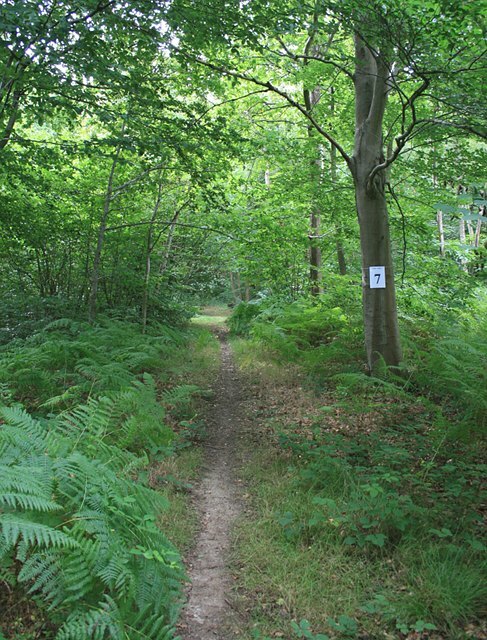 However, use of a compass would have demonstrated that the marked route lay down the west side of the heath, alongside the woodland margin, here to reach the flags of checkpoint 5, before proceeding east along the path along the southern perimeter of the forest. 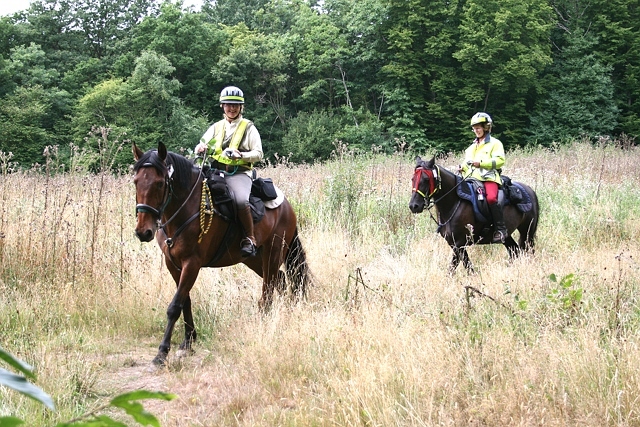 Beyond the checkpoint, riders continued along a pleasant and partly open path along the margin between the forest and the golf course, kept cleared of trees because of the adjacent ETL, then bearing north-east and through a gate (the one on the left) into d'Abernon Chase. The Chase is a clearing in the forest, with a former forester's cottage. The route continued out the other side, through another gate, and immediately right along a grassy ride (the map shows two rides off to the right here: only the correct, more clockwise, ride is obvious). After passing an electricity pole, there was a left turn onto the new ride, which continues north-west across the forest, parallel to The Avenue. However, there was a brief detour onto The Avenue itself in the vicinity of Upper Gravel Pond, with a ticket immediately following, in order to avoid a fallen tree on the new ride. Two-thirds of level 2s, but no level 3s, missed this ticket (though I'm not entirely clear how, since the fallen tree obstructed passage along the new ride!). Riders may have noticed that the ticket was framed with foliage, to conceal it from those who approached along the New Ride (notwithstanding the fallen tree), and to reduce its visibility to those on The Avenue: it seems to have worked! Returning to the new ride, competitors might have assumed from the map they continued north-west along it until reaching a T-junction: however, notwithstanding the map, the ride does continue north-west to join the drive to Fairoak Lane at an acute angle, and those who missed the left and then right turn into the drive would also have missed a ticket. About half of level 2s, and one individual at level 3, did indeed miss it. Riders left Prince's Coverts through a gate and crossed over the busy Fairoak Lane at Highgate Cottages, into New Road, which was encountered earlier. 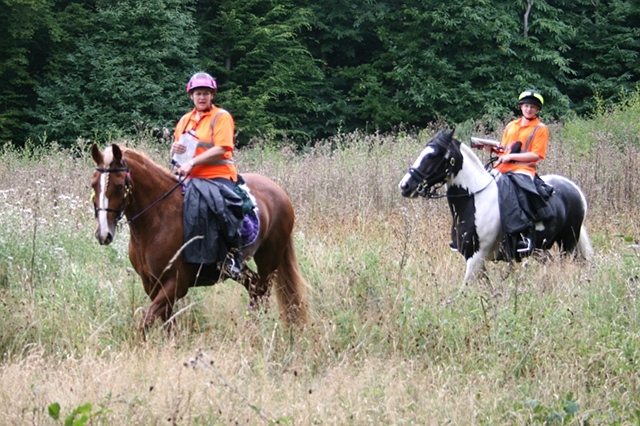 Level 2 riders rejoined the level 1 route by turning right into Great Oaks, but with a modest variation in the route to be taken through Sixty Acre Wood, and a different ticket number 3 to be collected: two pairs and two individuals missed this at level 2, with no misses at level 3. 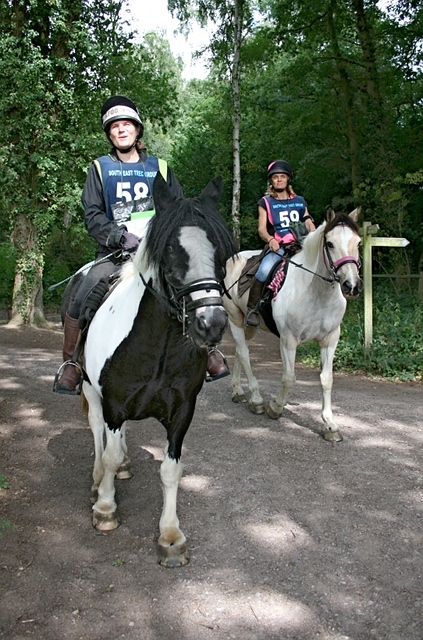 Level 1 riders completed the POR at the same checkpoint (numbered 6) as level 1, on the northern side of Sixty Acre Wood, at a distance of 21.8 km. This year's PORs seemed to go pretty well, and be received well, with the obvious exception of the unfortunate error at Loseberry Farm. I started very late on the planning this year, and would like to thank the TDs, Joy Taylor and Gemma Marriage, for their tolerance in surveying and approving the route very close to the wire. Indeed, there were some elements which were only resolved in the week before the POR, including arrangements for access into Broomfield Ride (through no fault of the residents' board, I should add). The POR has been described by some competitors as 'technical'. 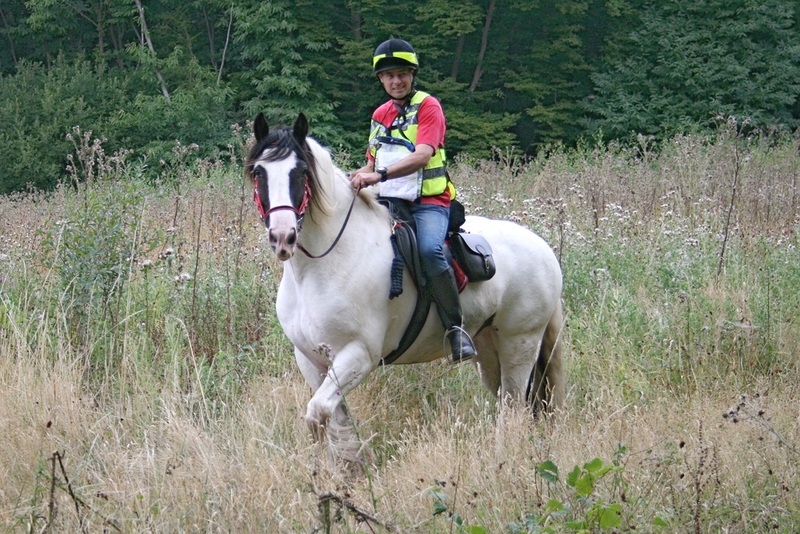 In the sense that the route was almost entirely on undesignated paths and tracks, that is true: that is the nature of the locality, with few public bridleways, but many horse rides and ubiquitous forest tracks. So the route was bound to be challenging to copy out, particularly at level 2, where with hindsight we might have allowed more time. And Prince's Coverts is and always will be an exceptional navigational challenge, with some new rides unmarked and old rides vanishing through disuse. Indeed, with onsite management of the Coverts having ceased some years ago, as each year goes by, fewer rides remain practicable for use. I had wondered whether we would be able to adopt routes which were sufficiently distinctive from those of the Barwell Court Farm BHS TREC 2011, but I was quite pleased with what we were able to do. 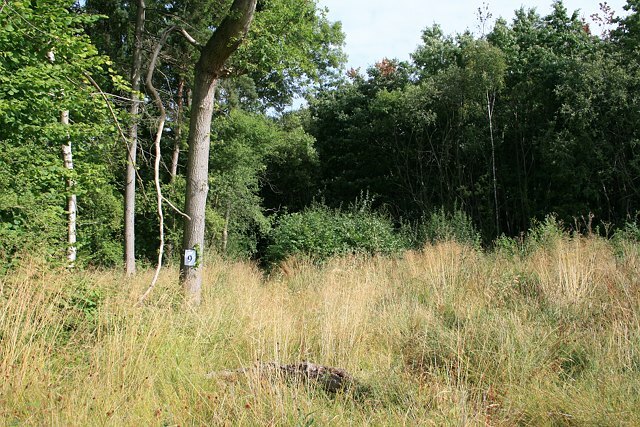 Level 1s took full advantage of the access generously provided to Loseberry Farm to avoid a repeat of the 2011 circuit via Esher Common and Oxshott Heath, while level 2s reprised the 2011 level 3 penetration to the very southern edge of Prince's Coverts. 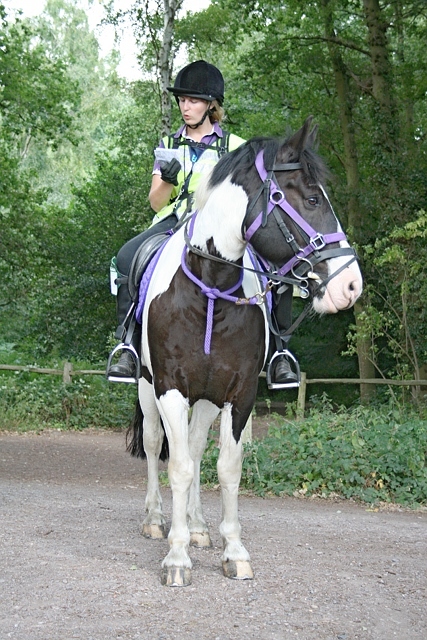 Compared to 2011, we were also able to take level 2s across Copsem Lane on a different alignment, afford an opportunity for a good canter parallel to the A3 (dog walkers permitting), take them round Oxshott Heath in the opposite direction, and use a more direct route between the Heath and the Coverts with a straight over crossing of Fairoak Lane. The tickets proved to be a good challenge, with many misses, although we lost one for the level 1s. And as always, some of the checkpoints managed to catch out a good few — except at Prince's Coverts, where it caught out everyone, level 3s included! This year (unlike the Swanworth POR), everyone seemed to be enjoying the ride and the challenge. Perhaps that's because at level 1, the opportunities for getting really lost were fewer (although some had a good try round Arbrook Common). Whatever, that's the reward for me (well, that and wrong routing riders into my checkpoint!). Barwell Court is part of the hamlet of Barwell which has been here since at least mediaeval times. There is the house itself, subdivided into three (still very large) units, together with the farm and livery stables. 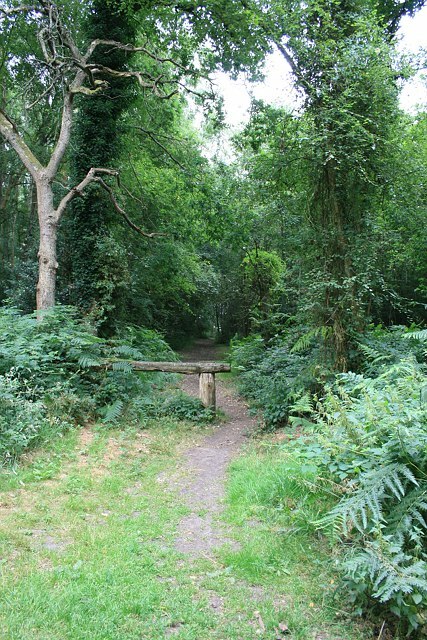 Despite the location on the border with Greater London, Barwell remains sequestered from the ever expanding suburbs, and can be reached only down a country lane (Barwell Lane) from Chessington, or along the bridleway over the A3. (Not counting of course the A3, which slices through the estate.) We have been fortunate to hold two TRECs at Barwell Court, and grateful to the trustees, but sadly there will be no more. The Barwell Court estate has been on the market during the summer, and is now understood to have been sold in a number of lots. See these links for particulars of the house and land (1) and land (2) while they last.